Every Tribe Every Nation Making Bibles Accessible And Translating It Into All 6,000 Plus Languages: In today’s episode, we talk with Mart Green president of Every Tribe Every Nation which is an organization that is making Bibles accessible and translated to the heart language of all 6,000 plus languages of the world. Their goal is that all 7 billion plus people in the world will be able to read the Bible in their heart language. Tune in now to hear how they are doing it and how you can help! The Courageous Leaders Collection Use promo code WBL17 to receive 10% off your entire order! Heroes of History Use promo code WBL17 to receive 10% off your entire order! You found your way to the intersection of faith and the culture, this is WallBuilders Live! Where we’re talking about these hottest topics on policy, faith, and the culture, always looking at it from Biblical, historical, and constitutional perspective. We’re here with David Barton, America’s premiere historian and the founder of WallBuilders. Also, Tim Barton with us today. You can visit us online at our websites WallBuilders.com and WallBuildersLive.com, a wealth of information at both websites. I encourage you to check them out. They are new websites over the last, I guess, two months since we’ve had the new websites there. Really sharp, so go check them out if you haven’t been there yet. Alright, David, Tim. Great topic today, great guest later today, and actually representative of a family that’s just been wonderful in the culture over the last few years and certainly when it comes to that document that is the true founding document of America, our Bible. They have been champions for getting the Bible in the hands of people all over the world. It’s the Green family of Hobby Lobby. Yeah, the Green family. They are a really terrific family, really philanthropic, but not in the sense of just wanting to give. They want to make a lasting difference. So, when you look at David Green who’s kind of the patriarch of the family who got Hobby Lobby started in his own kind of backyard, a little shop and it became a little local place and then spread all over the nation. David is such a good guy with such a good heart. He loves the Lord, a really solid Biblically grounded guy. He has two sons, Steve and Mart. Steve is the one who really runs Hobby Lobby now, the president over Hobby Lobby. And Mart is the one who runs Mardel Christian Bookstore. And so Mart is the real artistic guy. He’s in movies. He does all sorts of creative stuff, really a cool guy. Matter of fact, he’s the guy who really stepped in and helped save Oral Roberts University when they were so much in debt. They stepped in and kind of took the helm there and got them out of debt. Just good business practices. And now it’s a growing prospering university, very solid, very conservative, and Mart is still the chairman of the regent board there. So, they get involved in so many things as you mentioned, the Museum of the Bible. I remember before they even started building it I went up with them and toured all the documents and Bibles they had. It’s the largest collection of Torahs in the world! They help Jewish synagogues who need Torahs. The archaeological stuff they have from cuneiforms to Dead Sea Scrolls, all the way through the most recent Bibles. It is the most massive collection of Bibles in the world. They’re doing that to preserve it for future generations. So their whole attitude is giving, giving, and giving, and serving. They’re just a terrific family top to bottom. We’re always talking about the various areas of the culture. We don’t talk a whole lot about business, but Christians going into business for the purpose of being able to fund ministries and being able to fund movements in the culture is just a great example of that. Using this wonderful free market system we’ve been blessed with and taking the blessings that they’ve been given by providing a great product through their company but then turning it around and taking that blessing and being philanthropic in a way that really makes a difference. We’re going to take a quick break. We’ll be right back. Later in the program, Mart Green will be with us from Hobby Lobby. 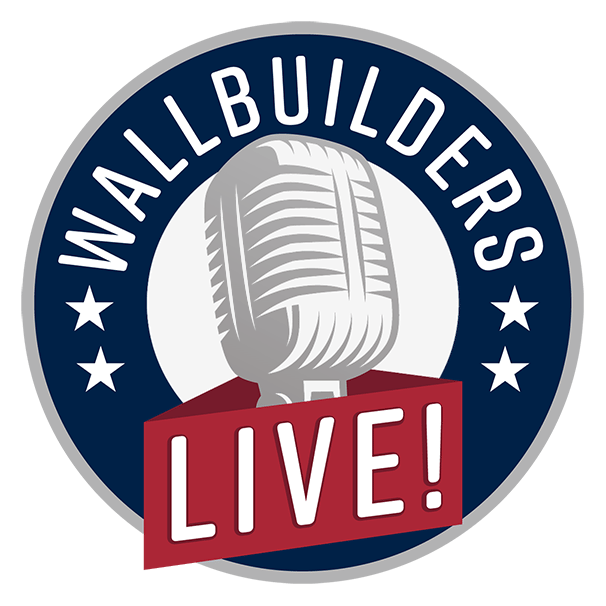 Back in a moment with David Barton on WallBuilders Live! This is Tim Barton from WallBuilders with another moment from American history. The Reverend James Caldwell was a famous minister during the American War for Independence. His sermons taught liberty and God’s opposition to tyranny. The British hated him and tried to kill him. So for his own protection, he would actually take loaded pistols with him into the pulpit and lay them beside his Bible as he preached. In the 1780 battle of Springfield, the Americans ran out of wadding for their guns which was like having no ammunition. Pastor Caldwell ran inside a nearby church and returned with an armload of Watts Hymnals, the pages of which would provide the much-needed wadding. He took this great Bible-based hymnal, raised in the air, and shouted to the troops,”Now put to watts into them Boys!” This pastor’s ingenuity saved the day for the Americans. Thanks for staying with us on WallBuilders Live! Back with David and Tim Barton talking about the Hobby Lobby family, the Green family and the blessings they’ve been to expanding the Bible being available to people. The Bible museum, David, you were mentioning, just that whole idea of taking the blessings they’ve had through business and blessing the rest of the country in the world with as a result of it. They are a conglomeration because they have a bunch of different businesses. There are so many things they do. But their faith is such a prominent part that, if you remember, just a year or two years or whatever it was ago, at the Supreme Court when the Hobby Lobby case, Little Sisters of the Poor too, but Hobby Lobby goes to the U.S. Supreme Court because under Obamacare they’re being forced to provide this abortifacient, which ultimately is an abortion for a pregnant woman. And that’s kind of the perception that we have in modern culture. “If you are just a business to make money you don’t get religious exemptions. But the way they operate their business it was so clear they were a religious organization that the Supreme Court said, “There’s no way we can do anything other than recognize your religious organization, therefore you get a religious exemption. So even though they are in the business of “making money” their behavior, their performance, their attitude, and their mentality is so blatantly Christian that it was even simple for the U.S. Supreme Court to look and go, “Oh, no, you guys are definitely a religious organization.” Which is a huge indication of the way that we should operate our business. People will know us by our fruits. Well, exactly. But the second thing I wanted to mention, which it was what you pointed out coming out of the break, is they really have been able to bless a lot of people because financially they have been very successful. It reminds me of lesson, Dad, when we were growing up and you were building houses, I remember when I first heard the story of why you were building houses, it really was shocking to me because I never thought of this but it was because you read a Bible verse that you felt compelled you needed to find a second job so you can make some more money. Yeah, it was a verse out of Ephesians 4:28. I was on staff at a church, full time, just after church. But it was a small church and it doesn’t pay all that huge amount. It’s in the country. It was enough to live on, but it wasn’t enough to do much past that. You had to live pretty skimpily. I think at that time we were in a 400 square foot house, total is what we were living in. Four 10 by 10 rooms and that was it. So, I heard a sermon from my pastor, which my pastor was actually my dad. Tim, he’s your granddad, where that he preached at Ephesians 4:28 and it says, “Work that you might have to give.” So the purpose of work was to be able to have something to give. And I thought, “You know what, I don’t have anything to give because our budgets are too tight.” So, I went out and started working a second job so I could take the income from that job to give. It started out just learning how to deck houses, and then framing work, and then running framing crews, and then I started my own business and then building houses top to bottom custom construction. And we took the money from that so we would have something to give. And all the time I was still a full-time church staff. But that was the purpose of a business was so I could have something to give. By the way, notice out of Luke 8 that it was wealthy businesswomen who funded Jesus. Jesus’s ministry was funded by a number of wealthy businesswomen. And that’s what allowed him to operate for those three and a half years was people were funding him. And that’s exactly what the Green family has done with Hobby Lobby. They’ve earned it. They’ve worked hard. And it’s been so they could give, and give they have. And one of the things they’re doing, not a new project I guess. It’s been about six years that they’ve been working on this. Which is this idea of being able to get the Bible translated into all these different languages out there that have zero access to the Bible right now. I had no idea until doing research for this interview that there were so many out there. So, it’s really interesting what people are going to find out here. Amazing what the Green family is doing to help change that. Mark Green from the family that owns Hobby Lobby is our guest today. Stay with us we’ll be right back on WallBuilders Live! Have you noticed the vacuum of leadership in America? We’re looking around for leaders of principle to step up and too often no one is there. God is raising up a generation of young leaders with a passion for impacting the world around them. They’re crying out for the mentorship and leadership training they need. Patriot Academy was created to meet that need. Patriot Academy graduates now serve in state capitals around America, in the halls of Congress, in business, in the film industry, in the pulpit, in every area of the culture. They’re leading effectively and impacting the world around them. Welcome back! Thanks for staying with us here on WallBuilders Live. Our guest today, Mart Green. He’s the founder of Mardel Christian and Education Supply and also, of course, part of the Hobby Lobby family. Mart, great to have you on, Brother. It’s good to be here, Rick. Looking forward to meeting with you. Hey, man, tell us about Every Tribe Every Nation. You guys have already made significant gains in translations and bringing them together and getting them out there to the world. I watch some of your videos online it’s just obvious God moved in your heart several years ago and now to see that vision started to come true has got to be pretty cool. Yeah, it’s been an exciting process. For me, it actually started back in 1998 when I watched a man weep to get God’s word in his language. The people of Guatemala and at that time I had just learned that there were six thousand plus languages on planet Earth. I had no idea. In round numbers about 2,000 have adequate scripture, 2,000 are being worked on, and 2,000 nobody has started. But when I watched him weep, his Bible translation took much longer than average, but because of guerrilla warfare and all that, it took 40 years to translate it. So, when they handed him his Bible he did something I’ve never seen in. As you said, we have Christian bookstores I sold lots of Bibles and helped people get that right Bible. I never saw anybody openly weep over it. But definitely, Gaspar did on February 7th, 1998, that one moment really changed my life. Forty years? So you had converts. You had missionaries in that area. They wanted to get Bibles in the hands of that community and it took 40 years? Yeah. Like I say, I met the translators and when I first went down there I didn’t know much about the story. I helped pay for the printing of the Bible. I didn’t sponsor him for 40 years. So they had to go back and forth and I probably would have just gone back home. But they went back and forth with four young children, you know, and raised their four kids. They’re my heroes if they can do that kind of work. Amazing! I was just, in fact, I forgot to mention you also were the producer of End of the Spear. My pastor just Sunday was talking about the whole story. I thought it was wild that I was going to get to interview you today. But you know, it’s hard for us to sit here in our affluent society and blessed as we are and all the technology. We get on our Bible apps or our dozens of different translations and Bibles sitting around the house. Frankly, we’re kind of spoiled. It’s all around us and it’s hard for us to imagine. Nineteen hundred languages that have no access, no translation, whatsoever. Because I think Jesus would speak to you in your heart language. Your heart language is the same language you’d proposed to your wife. Now, many times people do learn a trade language to get a job or whatever. They may know Spanish but their heart language, what they really understand, and what they speak and propose to the wife in. I know that Jesus would speak to you in the language, the same language that would be your heart language. So, I became very passionate about making sure even the smallest people groups that they would have God’s word in their language that spoke to the heart. Well, tell us about the mechanics of how this works, the digital Bible library, how it’s coming together, and what people can do to help. We cut together an alliance called, “Every Tribe, Every Nation.” My idea was, “What if we have the ministry partners together and the resource partner?” I’m not a Bible translation agency. I’m on the donor side, the resource part. What if both of those came together and had a big project, eradicating Bible poverty, that’s what we call it. That’s the big goal, to eradicate poverty, to make sure everybody on planet earth, all 6,000 plus languages have God’s word in their heart language. So, we meet in the Dallas airport every month representatives of those 12, not all 12 make it every month, we have four or five resource partners and we just say, “How can we do this?” What we call, “better quality” because any time with God’s word we don’t sacrifice quality, we want the best quality, faster, and cheaper. Well, usually you can’t have all three. But we believe by working together coming up with tools. One of those tools, actually, the first thing that we put together, is the Bible library. Because we live in a new world now and some of these texts that are for smaller people groups in other language weren’t even a digital format. So people like YouVersion, there’s other Bible apps, YouVersion is one of most popular Bible apps out there. They were trying to chase down all these rights and they were going to fly to Korea and then fly to Brazil because a Bible is intellectual property. And so it was going to take years and years to go get all the rights and convince you to give me the rights. So, we thought, “What if we build a digital library and then people like the mobile world at the same time the print on demand will say, ‘Hey, you know, we could print any parallel Bible you wanted.’ Now I have Christian bookstores but I can’t carry an eastern Hovell Tech NIV Bible. Nobody requests, I might have Spanish-English. But I don’t have that. But you can do any combination. If somebody moved to America, came to your church on Sunday, by Monday you’re going to have them a Bible in their heart language with English side by side. We live in a world that that’s all possible but it really wasn’t very practical because they weren’t digitized. So now with the digital Bible library, we have over 1,000 of those languages now all in the digital Bible library. So, people like, again, YouVersion, when you download that app on your phone if you open that up there’s actually 1,043 different languages on one. The only app that I’m aware of that has a thousand languages. Well, I didn’t even realize that. That’s the app I use. So it can actually access all of the translations that you’ve got in the digital Bible library now? Yep, that’s right. So, instead of YouVersion chasing those rights around, which even America took us a year to get, it would have taken a much longer to get others. Once they get on the digital library about 15 minutes later it’s up on YouVersion. So, they don’t even have to worry about the rights anymore. They worry about how to get more people to use it, how to get more downloads, more people highlighting, all those kind of things. That’s amazing. So, this is, if I understood the videos on the website correct, and folks, the website to go visit it. It’s http://www.everytribeeverynation.org/ and you can donate there. You can sign up and find out what’s going on. You can learn all the different partners that are involved. But as I was watching the videos, Mart. If I understood it right, your vision is within 20 from now to have all of these languages having a digital version of the Bible? Yeah, Rick, there’s just a sense of urgency. People die. So, my family mission statement is six words, love God intimately, live extravagant generosity. So that first part, love God intimately, there are several ways. I’ve been thinking about this, “How do I get intimate with God?” There are several ways. The number one way for me has always been God’s word. That’s how I know him is through God’s word. So, if I want that for all seven billion plus people on planet Earth then I have to make sure they have God’s word. Because that’s how they’re going to get intimate with the Lord. So we believe that by 2033 that 95% of the world will have a full Bible. Which is 5,000 speakers or more, 99.9% percent would have at least the New Testament. That’s 4.9% of the people, that’s 5,000 speakers or more. And that 100% would at least have a portion of scriptures in all those languages. So it’s not a finish line goal by any means. Really we need every tribe, every nation, every verse current. Which will probably keep going until Jesus comes back. But by 2033 we believe 100 percent of the world can’t have those scriptures with 99.9 percent have a New Testament or more. One of the things I enjoyed about the video was almost a calling. It was reaching out to individuals and saying, “Hey, look, we need innovators. We need translators.” There are people out there that have a gift for these kinds of things and not yet found where God can use that gift for them. So, here’s a perfect place for them. So, you know, people out there that have a gift of language, if you will, that have gone, “Well, what can I do with that in the world today?” Man, here’s a perfect place to go. Yeah, there are business people, there are pilots that help us get the translators to remote places. So, yeah, almost anything you can think of those positions are available in translation. So if God has called on people like I said, we have 12 different partners. I only found out in more recent time that sign language is not universal. I just kind of assumed, obviously ignorantly, that sign language was universal. But there are 400 identified sing languages of the world. We only have one New Testament involved at all. So there are certain people have sign language skills that can help in that area. So you have to videotape those because most people who can’t hear don’t learn to read because reading is by phonics and you hear. That’s how you learn to read is because you hear and you do that. So if you don’t hear you probably don’t read much past a second or third-grade level. We’re working together, so three of our 12 ministries are in the deaf and help to sign language. So, yeah, there’s almost anything you can think of. There’s a position for people if that is what God’s calling is on their life. Phenomenal, EveryTribeEveryNation.org is the website. Mart, God bless you guys! Your family is such a blessing to not only our nation but the entire world frankly, appreciate what you’ve all been willing to do in fighting some of the political battles out there. But certainly what you’re doing with the with the Bible and the Bible Museum in DC and all the different things. We just we just appreciate you, man. Appreciate you coming on and spend your time. We appreciate you Rick, and David on what you guys do to help let America remember what our roots are. We have to we go back to where things started. You guys did an incredible job of reminding us of that. I appreciate that. Mart, thanks for your time today man! Stay with us folks, we’ll be right back with David and Tim Barton. Hi, friends! This is Tim Barton of WallBuilders.This is a time when most Americans don’t know much about American history or even heroes of the faith. I know, often times as parents were trying to find good content for our kids to read. If you remember back in the Bible, the Book of Hebrews it has the Faith Hall of Fame, where they outlined the leaders of faith that had gone before them. Well, this is something that as Americans we really want to go back and outline some of these heroes not just of American history, but heroes of Christianity and our faith as well. I wanted to let you know about some biographical sketches we have available on our website. One is called, “The Courageous Leaders Collection” and this collection includes people like Abigail Adams, Abraham Lincoln, Francis Scott Key, George Washington Carver, Susanna Wesley, even the Wright brothers. There’s a second collection called, “Heroes of History” in this collection you read about people like Benjamin Franklin, Christopher Columbus, Daniel Boone, George Washington, Harriet Tubman, the list goes on and on. This is a great collection for your young person to have and read. And it’s a providential view of American and Christian history. This is available at WallBuilders.com. Yeah, they’ve really been in so much stuff. When I when was in D.C. and went on the topping out of the Museum of the Bible, should open in about November of this year. Which, by the way, I am so excited about! Of all the museums in D.C., this is going to be the coolest one there. It sits right over the top of the Department of Education. They actually built two floors on top of the building, a metro station comes into the Bible museum. What a terrific place it is! And the technology guys, people might be thinking, “Bible museum? Going to go through and look at these old books?” The technology in this thing is unreal. I did not know that Mart was into that aspect of scriptures. That he was he was wanting to make that kind of difference with 2,000 languages! But also, one of the things he said in the interview that was so interesting is, for example, one of those languages only 400 people in that language could read. So, you’re doing this work. So it’s not like these this significant like Chinese or the English or German. No, this is a tribe somewhere, right? This is a small people group. He is so focused on that. What he does there, and what they do at Hobby Lobby, and at Mardale, or you and so many other endeavors there in, it’s just great. One of the things God told Abraham in the Bible is, “I will bless you and you will be a blessing.” So one of the Biblical principles we see is what God does for you. We’re supposed to take what God gives and give to others. And Dad, even as we mentioned earlier, with you getting a second job so you would have something to give. But this is where Christians can further God’s Kingdom. When we are financially successful we have something to give to help those around us. EveryTribeEveryNation.org, that’s the website, folks. Go there to find out more. Thanks so much for listening today to WallBuilders Live!